Taking pictures is something I like to do very much. I’m not terribly talented when it comes to doing it and my equipment is pretty basic, but I enjoy framing something up and preserving that moment. I used to take a lot of pictures, but I’ve tapered off in the last few years, and I miss it. I am forcing myself to get back behind the lens with a daily photo challenge for October. The twist – BET YOU DIDN’T SEE THIS COMING – is to see if I can find something diabetes-related to photograph for the month. If I can, awesome. If I can’t, that inability shows how diabetes can’t and shouldn’t always be front-and-center. Want to join me? I’ll be posting on the blog and Instagram under the hashtag #DOCtober. For #DOCtober 1/31, I’m already cheating a little by posting a photo from last week. 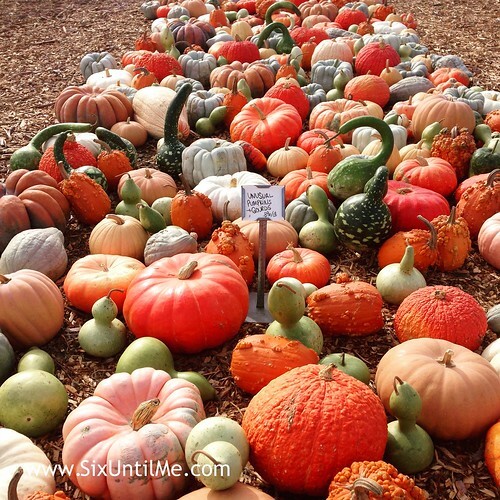 The sign reads, “Unusual Pumpkins + Gourds.” And it reminded me of you guys, the diabetes community. The patient community. The community of people who are touched by some kind of health condition but aren’t owned by it and are beautiful because of and despite it. Well sheeeeeeeeet, if we aren’t all a pile of beautifully unusual pumpkins and gourds. That Big, Effing Frog. #DOCtober Photo-A-Day: Check. Photo-A-Day: Past. Photo-A-Day: Proud.